In our present global market structure major emphasis is given on consumer satisfaction. This is because as more and more sellers enter the market they struggle to maintain their existing customer base. Consumer satisfaction and increase of goodwill ensures that the busy will earn maximum profits. But if any product or service for which a consumer has paid the necessary price is not in par with standard the consumer reserves the right to sue for damages or even seek a replacement. This entire procedure starts with a Sample Complaint Letter, filled out by the consumer explaining specifically what aspect of the product was un-satisfactory. This is one of the simpler, rustic, yet effective templates. The form begins with basic yet detailed information of both parties, the buyer and seller. 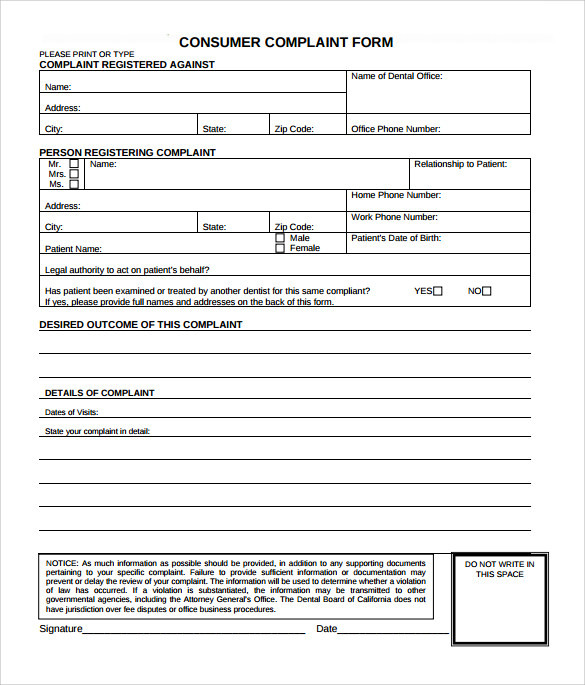 The template is based off of a Dental complaint, but this customer complaint form doc can be easily modified to suit the personalized needs of any person or firm. 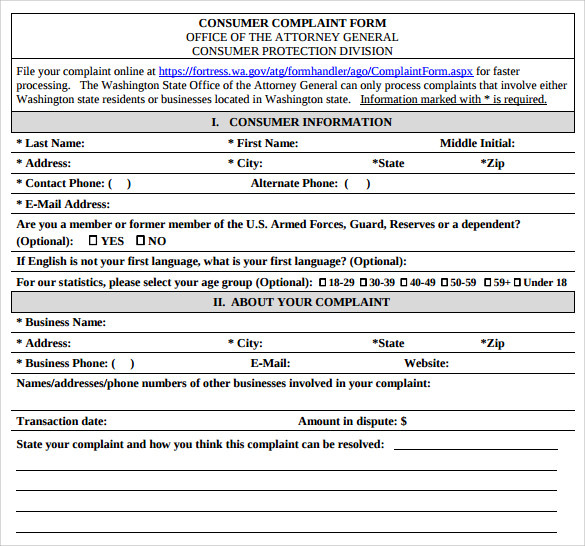 This is a fully professional and highly-detailed example of consumer complaint form’s format. It contains necessary details in easy to fill check boxes where the aggrieved party can input information timely and concisely. Other factors include details of party against whom complaint is being lodged, date and nature of transaction, mode of contact, method of payment etc. 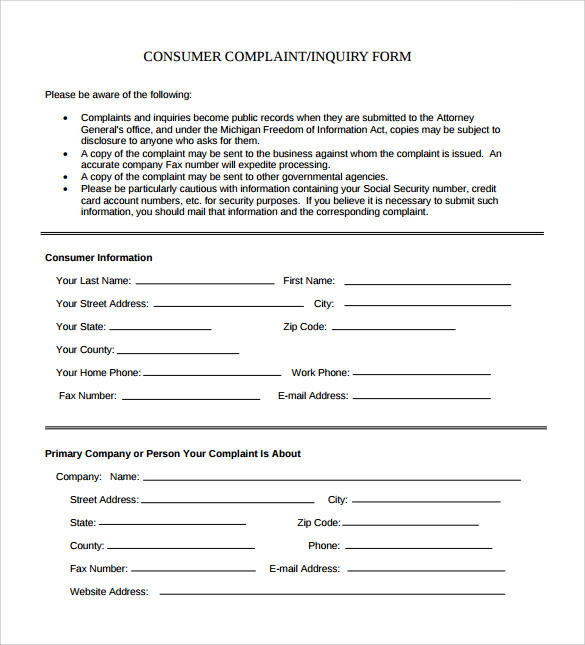 This customer complaint form sample is a simple one-page document which contains details of the transaction which has transpired. A disclaimer on the form warns potential users about the dangers of including bank information or social security number. 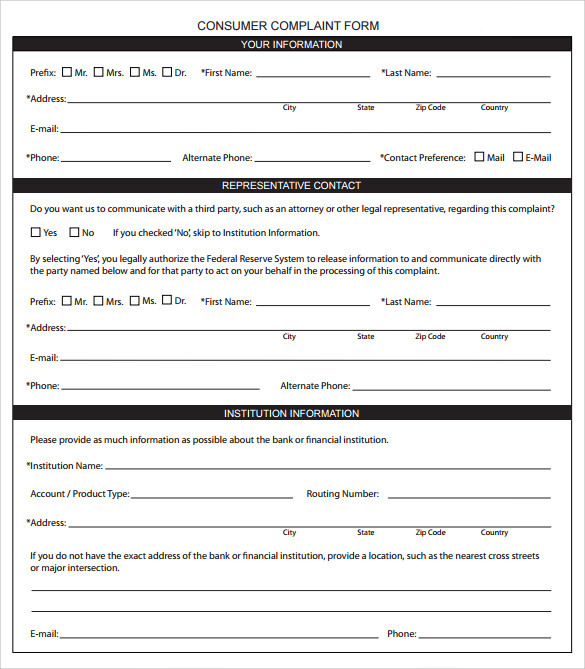 The form is short and easy to fill up but provides less space for details. 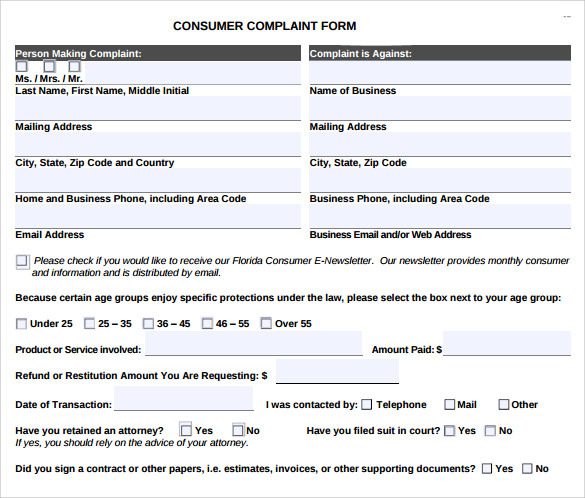 This free customer complaint form template follows the format of a usual complaint form. It contains personal details of the aggrieved party and also provides ample space for explaining the situation. 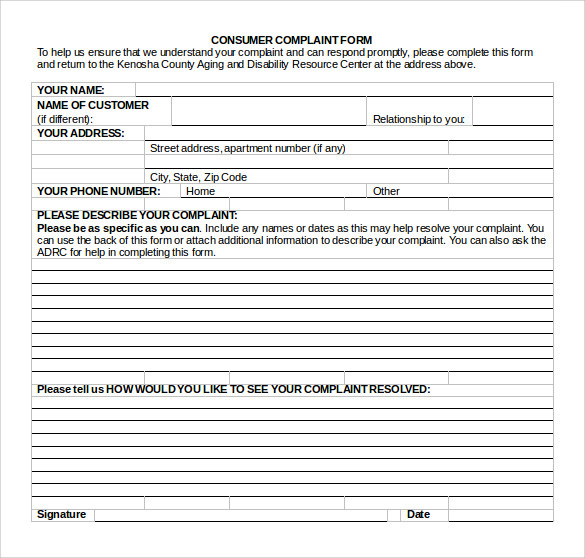 This form also offers quite some space to ask the consumer how they wish to resolve the issue, followed by a signature. 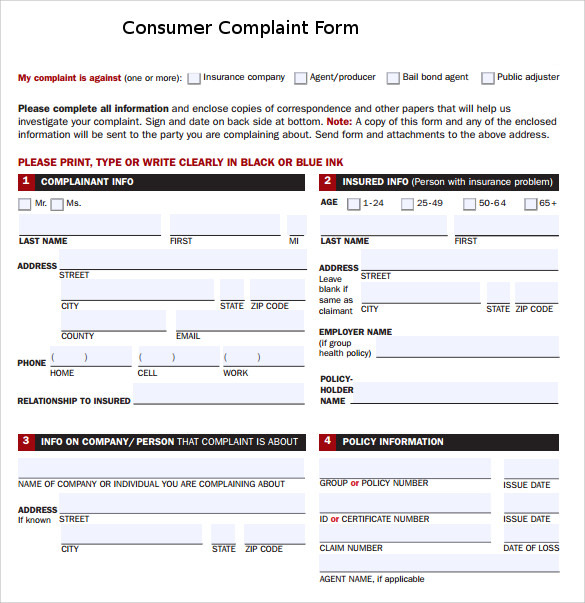 The uses of these Consumer Complaint Forms are quite evident to those who have paid the necessary price for a commodity or service but have been met with rejection. Earlier consumers had to live with any bad purchase made and bear the consequences. But now with the advent of the Consumer Forum a consumer can legally and rightfully voice his concern through an official document. A consumer may wish for his money back, claim damage charges or even seek replacement. These templates offer quick and easy solution to those who seek a proper, professional form for their issues. 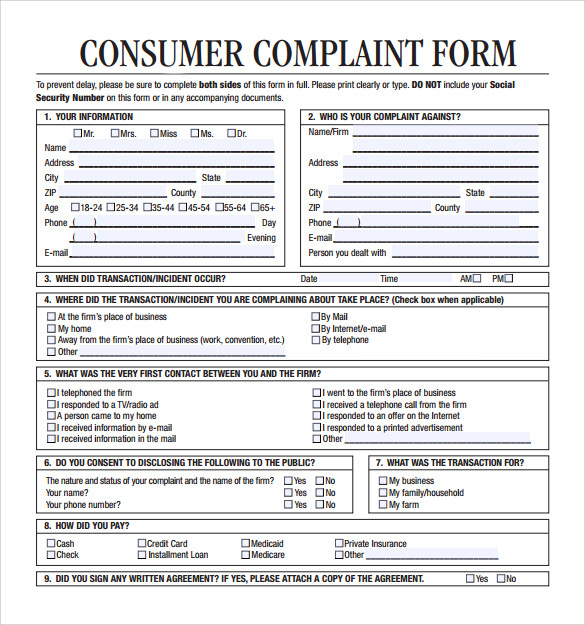 Target audience of client complaint form templates are the consumers of goods and services. Consumer is quite an ambiguous term which includes everyone who has been cheated or tricked off of their rights. While purchasing a commodity a consumer enters into an implied right with the seller. It being that the buyer promises to pay the price and the seller sticks by his quality of goods. Any person who has suffered breach of this contract reserves the right to complain. These templates provide a wide array of choices and can be used by either a customer seeking compensation or a firm which wishes to adapt a Complaint Form into their database. The benefits of these forms are manifold. Any person who has been disheartened by a faulty product can seek justice. They have their choice of method; they can seek money-back, replacement or compensation. The templates here offer a large variety of choices, from being strict, lenient, understanding and unbiased. Normally complaining about either about product or a service is a long and hectic process with the concerned authorities often finding some excuse or the other to delay reimbursement. The purpose of these templates is therefore to help you avoid all such troubles and fill up the Business Complaint Letter form perfectly on the first try. We conclude this by saying that these templates have been carefully made to suit your needs, available for download at both free and a nominal price. They serve their purpose resourcefully. The main thing is to not be afraid to fight for your rights, if you have been deprived of something it is your right to complain about it.